The MSI Metis 266 SlimPC AMD AthlonXP bare bones system. Sleek, black, and packed full of features like video, audio, and networking. It seems the Small Form Factor PC craze that started early last year by an obscure Taiwanese mainboard manufacturer looking to diversify is really taking off. With several smaller manufacturers already jumping on the SFF bandwagon, it was only a matter of time before the "big guns" introduced their own take on SFF type systems - coined the SlimPC, or 'book size' PC, this system from MSI is just one such example. 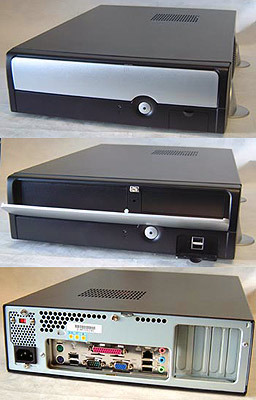 MSI Computer have named this very sleek, very clean looking black & grey slim PC system the Metis 266. In fact, the front of the Metis 266 consists of just a blue LED backlit power button, tiny white LED activity LED, grey drive enclosure, and tiny flap concealing two USB ports. Based around MSI's very own Socket A Micro ATX MS-6390 (VIA KM266) motherboard, the system supports any 200/266 MHz FSB Athlon based processors. Other standard features included are 5.1 audio (AC'97 codec), USB 2.0 and on board 10/100 LAN. Even though the MS-6390 motherboard has an integrated ProSavage8 video chipset which is more than sufficient for daily office use, or internet we decided to forgo it altogether and instead try something a little different. Since the MSI MS-6390 mainboard supports a 4X AGP slot, we picked up a MSI 8890 GeForce4 MX440SE AGP-8X video card. Since this is a book sized PC most "standard sized" video cards will not fit inside the 9cm thick case. The reason we chose to test with the MS-8890, and the reason we were able to is because it is a half-height card. Where standard videocards measure on the order of 87mm tall (from the back of the card), a half-height card like the MS-8890 is just 51mm tall. Another potential benefit of using a additional AGP card like the GF4MX440-8X is that it supports TV-Out. Rounding out the other features on the Metis 266 are two DIMM slots which can hold up to 2GB of PC1600/2100 DDR memory, and three PCI's which will accept half-height cards. 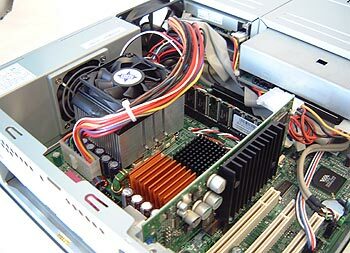 For those of you who might be wondering what exactly a Barebones system is, it might help you to know that the term "Barebones" is used by the industry to describe a prebuilt computer which generally consists of a preinstalled motherboard, case, power supply and heatsink - and that's about it. Items like the processor, memory, optical/floppy drives, hard drives, and video card are not included in Barebones systems, and depending on the size of the chassis, you may have to search for special components to fit. For example, the MSI Metis 266 comes with a MS6390 socket A mainboard which already has on board video care of an integrated ProSavage8 graphic controller. This level of on board graphics is good for web surfing and day-to-day office work as we have already mentioned, but if you want to do a little gaming you are going to need more graphics processing power. As the MS-6390 mainboard comes equipped with a 4X AGP socket it is feasible to install a half-height AGP adaptor to increase the level of graphic functionality beyond that of the ProSavage8 controller; which is exactly what we did, so let's move on. Internal cable management can be a bit tricky in the Metis266. The power cables wrap around the CPU heatsink (which MSI include) and if you are careless when sliding the cover back on they can get pushed over the fan impeller. 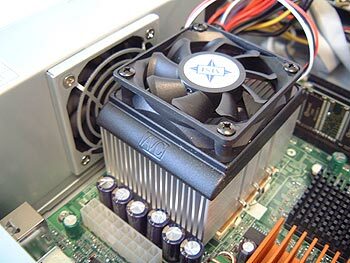 The power supply intake fan is adjacent to the CPU, and helps ensure the internal case temperature remains well controlled. The enclosure used for the Metis266 system looks like an Inwin BT553 Micro ATX case, and like all Inwin cases the BT553 is very well constructed, and laid out. The case is made out of steel and there are very few sharp edges... but like my usual clumsy self I cut my finger the one rough corner. Oh well, can't win them all I guess. The motherboard and case offer three expansion slots (not including the AGP slot), you can only use half height devices, but only if they have teh right sized metal mounting brackets. Luckily the motherboard just about everything you need already integrated.